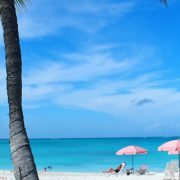 According to the resort’s original owners, their strategy in locating the hotel was based on providing for its guests optimal views of the Turks and Caicos sunsets. 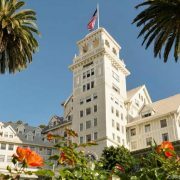 Fairmont’s recent refurbishment of the 276-room hotel catapulted the Claremont, which opened its doors in 1915, into the 21st century. The Fairmont Scottsdale Princess is a luxuriant, AAA 5 Diamond city resort spread over manicured grounds. The property is tucked into the Phoenix suburb of Scottsdale, near where 15 Major League Baseball teams warm up for the regular season. Blossoming beside the Pacific Ocean on the Kohala Coast, in the northwest corner of the Big Island, the Orchid is a beautiful, comfortable base from which to explore. The Kea Lani – which opened as a Ritz-Carlton in 1991 – has 413 rooms. Every room in the landmark hotel is actually a one-bedroom suite. Outside, on the lush 22-acre grounds, stand 13 posh two- and three-bedroom villas. This summer AeroMexico is launching the first domestic and international commercial services to Mar de Cortes International Airport, which serves the Mexican resort destination of Puerto Peñasco on the Sea of Cortez. I spent a night in the Lenkerhof alpine resort in late January 2012, when the local countryside was covered in several feet of snow. Rarely have I eaten so well and enjoyed so much the ambience of a hotel and its surroundings. Operated by Starwood Hotels & Resorts Worldwide, it is the first St. Regis in Hawaii. The St. Regis Princeville Resort’s bay views are framed on the far shore by rugged mountains that served as Hollywood’s stand-in for Bali Hai when the movie version of ‘South Pacific’ was shot on Kauai in 1958. A former 10th-century castle turned into a 41-suite boutique hotel, Hotel Castello di Casole – A Timbers Resorts Hotel & Residences is located in the company’s 4,200-acre private estate in Tuscany, within an hour of Florence, Siena and the Chianti and Montalcino wine regions. Best Western International Inc. has continued its expansion in South America with the addition of the chain’s first Best Western Premier hotel in Brazil, the Best Western Premier Majestic Ponta Negra Beach. By 2017, Marriott envisions its portfolio in the region rising to more than 140 hotels and 30,000 rooms, either opened or in the development pipeline. Emirates is an airline known for posh service, state-of-the-art infrastructure and attention to detail. Those same qualities are showcased splendidly in the Dubai carrier’s owned-and-operated Australian luxury retreat, Wolgan Valley Resort & Spa. 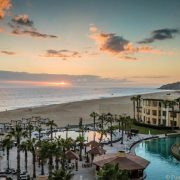 Grand Luxxe Resorts has opened new towers and buildings for its high-end luxury hotels in the Mexican resort destinations of Nuevo Vallarta and Riviera Maya. The two latest resort additions provide a total of 315 new suites. Viceroy Hotel Group has added the former The Tides Riviera Maya to its luxury Viceroy Hotels and Resorts portfolio, following completion of a major renovation at the beach resort. The property has been renamed the Viceroy Riviera Maya. The transformation has included an extensive redesign to L’Auberge de Sedona’s guestrooms and spa, as well as the addition of 30 luxury cottages, the Veranda Bar and the property’s first pool. Dunton Hot Springs, a 19th-century ghost town in Colorado’s San Juan Mountains which has been turned into a luxury resort, is offering a variety of winter activities for guests searching for fresh powder, climbing ice or outdoor and indoor natural hot springs. Each bungalow in the Le Maitai Lapita Village on Huahine is designed to evoke a sense of the Polynesian canoe house and is decorated with stylized canoe prows. Traditional paddles decorate the walls of the bungalows, and many feature furniture in the shape of a canoe. The Ritz-Carlton Reserve, a 115-key oceanfront hotel and residences, will be the centerpiece of the renovation of the Dorado Beach Resort, which is set to open in December 2012.